That episode was everything I could have ever hoped for. I legitimately can't even right now. Well, at least Jasper isn't depraved enough to try to fuse with a corrupted gem. "Hey Donut Girl, it's me...Donut Boy." Lion still manages to look cute when he roars. Poor Amethyst. Mr. Greg put Pearl through the wringer, now it's her turn (again). But she was part-right; when they relaxed, Steven and Connie fought better. But yeah, you gotta practice. The whole hangup about big vs. small is such a constant theme. But small Gems can gang up, outmaneuver, and use sneaky tactics against larger ones. Head-to-head, with or without fusion, is not the only way to fight. I am curious about Amethyst's new shirt; it's so...bland, for her. I know white is one of her colors, but it lacks much pizzazz. I wonder when she'll get a chance to reform again. Seems like Steven has a standard "battle size" shield for throwing. Jasper's tactic against Amethyst is purely mental. She got Ame thinking she was weak and the fight was over before it started. 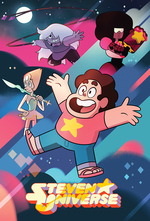 It seems like step 1 of beating Jasper is believing you can, just look at Garnet on the hand ship and Stevonnie on the beach, even Alexandrite versus Malachite wasn't looking great until the mostly morale boosting rally of the watermelon Stevens. Just look at how powerful Sugilite is, that's Amethyst's strength plus Garnet's confidence (and strength). Anyway, Amethyst talks big about her looseness, but that's really her weakness. we've seen time and time again that she's brash and emotional and ends up overcompensating for her perceived weakness. She rushed her reformation and came out worse for wear. I'm kind of worried They went full on Stevonnie wielding Rose's sword and riding Lion so soon. That always seemed like endgame material so now I'm worried about negative consequences of their fusion. What if Jasper goes after Connie to hit "Rose" where it hurts? P.S. Nice future vision, Garnet, way to go off chasing Jasper when she was planning on showing up in Beach City later that day. Or was that her plan all along? Is Garnet capable of doing anything that isn't a Batman Gambit? Or is Future Vision just weak against brash soldiers? I'm amazed that Amethyst doesn't use her shapeshifting more while fighting. A shapeshifter could potentially be a really strong fighter. She can fly while shapeshifted, she can become things stronger than she is normally (she shapeshifts into Purple Puma when greater force is required), and there are so many animals to choose from with different strengths and speeds. She could disguise herself and catch foes unawares, she could hide if she needed a breather, she could be unstoppable. The situation in Reformed was different. That was Amethyst's natural shape, which is limited. She shapeshifts, frequently into Purple Puma, when she needs extra strength, as seen in Log Date 7 15 2. I presume those shapes require energy to maintain, but that's the thing, Amethyst is the only non-fusion gem we've seen able to shapeshift into nearly any form casually. Shapeshifting is her special trick. My theory is it's because Amethyst has very high energy output for a gem, maybe a consequence of being in the ground for so long. Even if she couldn't gain strength from shapeshifting, there are plenty of other ways a fighter capable of instantly changing shape at will could take advantage of it. I really don't think this works like precognition. It's not really a psychic ability. I always seen it as a more active version of intuition. Garnet has explained more than once that future vision allows her to see all possible futures. This includes the mundane and the horrifying. Any action (or inaction) she takes could, potentially, be the most devastating thing she does/doesn't do. This is why we had the "Steven flips out about future vision" episode, to explore the extremes of this kind of power. Everyone of Homeworld, including Sapphire herself, thought that future vision was perfect. No one considered one incredibly dedicated Ruby could throw future vision off so much. We've seen future vision fail, or produce more unexpected results (Baseball! ), then we've seen it succeed or give Garnet a really huge advantage. Garnet probably just picks the path that is most likely or makes the most sense. Otherwise every slightly surprising thing that happens could be: "Well why didn't you warn/protect them, Garnet?" Jasper is driven by a desire for power. She believes her purpose is to be a powerful warrior gem, which is why she wants to re-fuse with Lapis, and why she wants to build her own army. I don't think we know anything about her plan for what to do with that power, though. Is she trying to salvage her mission? Is she hoping to redeem her failure by defeating the Crystal Gems? She knows about the cluster, right? Peridot told her back on the ship that the whole reason for coming to Earth was "to check on the cluster." If she knows about it and what it is, then she presumably doesn't know that Steven bubbled it, and so her actions take on a nihilistic take -- she's doing what she can to become more powerful even though she knows there is no ultimate end to it, that Earth's days are numbered, that unless she's rescued she'll be destroyed along with the planet. Is she that confident of rescue? Or does she think that there's no way YD would expend resources to collect her, so she can largely do what she wants? Another thing: How did Jasper get the corrupted gems to fight for her? They seemed terrified of her the last time we saw them. Does she know things about the corruption that the Crystal Gems don't? If she knows how to inspire their loyalty, maybe whatever she's doing is better for them than the CG approach of just neutralizing them until they can figure out something better. I mean, okay, maybe not, given that Jasper is basically our Unhealthy Relationship personification at this point. But "better than staying bubbled in the Temple" really isn't that high a bar to clear. Another thing: How did Jasper get the corrupted gems to fight for her? She beat and poofed them and when they unpoofed, they were too scared to fight back. I'm pretty sure "Fight for me or I'll shatter you" is a message Jasper can convey to a corrupted gem monster. Crack the Whip was the fifth highest-rated original cable program of its broadcast day, with 1.9M viewers. Dammit I just realized I've been missing a bunch of episodes because my DVR isn't recording the episodes properly. most likely because of the double episodes and the DVR thinks it's one 15 min one. Before this one, I saw Jasper in Alone at Sea. And that monster totally came out of nowhere for me! It's an established thing at this point, but I haven't mentioned before how much I like that Jasper calls Steven (and Stevonnie) "Rose". Because that's clearly how she sees him, as another form of Rose Quartz ... which is pretty much correct, in every way except the one that matters, i.e. he's his own person! It reminds me of how Ra's al Ghul always calls Batman "Detective", another appellation which is cuttingly accurate yet still misses nuance. With Jasper of course there's always an element of headfuckery going on. You aren't who you think you are; you are who I perceive you to be. Jasper's tactic against Amethyst is purely mental. She got Ame thinking she was weak and the fight was over before it started. This actually encapsulates it perfectly, I saw it happen but didn't think of it in such stark terms until reading that. Colour me convinced! Jasper is like Bane The Bat-breaker or Ox(-bridge) from the WWII Flying Hellfish episode of The Simpsons, her muscles just obscure the fact that there's a brain at work in there. They do say the best bullies are the ones who understand people. Good job she shares something of Amethyst's emotional looseness or she'd be even more dangerous. Seeing Amethyst reduced to a gem in battle was a shocker, even though we know it's possible. So glad she was saved, even if she isn't.